Are you invested in Monsanto stock like Bill Gates, who owns hundreds of thousand of Monsanto shares worth about $23 million? It might be time to pull out since the company just reported over $156 million in losses for the fourth quarter. It’s a tough time for biotech, and thank goodness. 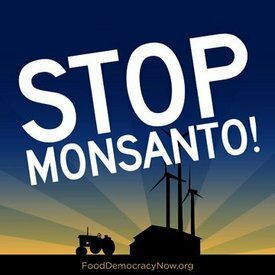 Monsanto’s losses were attributed to farmers in major agricultural zones favoring soy over GMO corn because of falling crop prices – largely caused by Syngenta’s release of MIR162 corn, which has been completely refused by Chinese officials repeatedly – which have depressed both local and foreign corn bushel prices. There is a looming $1 billion dollar class action lawsuit Syngenta will face, currently pending in three states over the release of AGRISURE VIPTERA® 4. All three class action suits were filed this past week in Federal Courts by U.S. farmers. Syngenta also just happens to be the company that has covered up the true toxicity of Atrazine, and the company has been sued in six different states to clean up more than 1000 water systems in six states where the herbicide has been found polluting rivers, streams, and lakes. Soybeans sales are still around $200 million, doubled from previous years, but they account for a much lower market share than the GMO corn products which Monsanto sells and promotes for use with their toxic herbicide, RoundUp. Adjusted losses for the biotech bully come to 27 cents a share, three cents worse than estimates. While it would have been nice to take down this Agri Business giant for different reasons, it seems the company’s partner in crime, Syngenta, is doing the work of dismantling the GMO paradigm for us. In the last two years, Monsanto has reported huge losses, so we must be doing something right. If this trend continues, and it should if we continue the good fight, then we can all hope to see the GMO Empire crumble in due time. Continue raising awareness and purchasing non-GMO, organic foods. Voice your words with your dollar. PreviousIs Science Finally Catching up to What The Ancients Knew About Crystals?